A Filipino fruit that smells like gasoline and tastes like pears, jackfruit, and pineapple. You can’t walk far through the streets of Manila without seeing what looks like the hide of a dried-out hedgehog on the side of the road. These are the remnants of a fruit known as the marang, which grows throughout the Philippines and parts of Borneo. 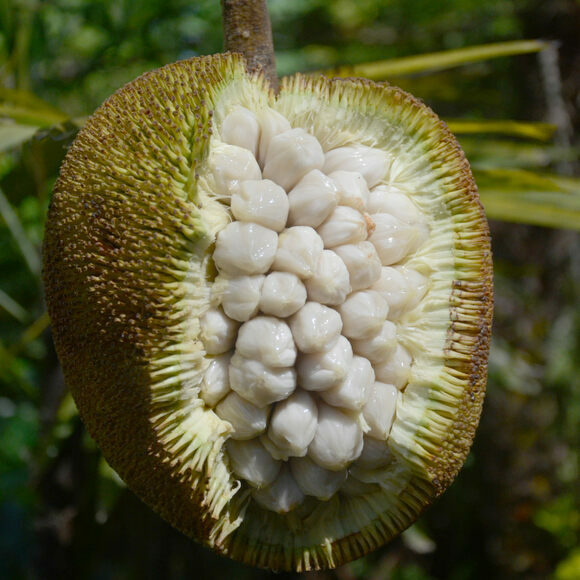 Unlike its more popular counterparts in the Artocarpus genus—namely breadfruit and jackfruit—marang has an odor that will funk up a room the same way that durian does. The scent is something like gasoline, but don’t let that deter you; the sticky white flesh inside tastes like a fruit cup. A wide assortment of different fruit flavors come together with every mouthful, including softened pears, berries, banana, jackfruit, and pineapple. Some fans also consider the aroma of gasoline to be addictive, akin to the pleasure of eating a stinky cheese. After feasting on one of these large fruits, the meal is not over; the seeds can be roasted or boiled as a snack and taste a little bit like potatoes and chestnuts. It’s not for everyone, but for those who love jackfruit but aren’t quite ready to tackle a durian yet, the marang is a tasty middle ground. Marang season in the Philippines typically occurs between September and October, but the crop occasionally resurfaces in December. The fruit so pungent it's banned from trains, hotels, and public places.